@bookblrb: A reluctant young immigrant chases her prize possession around her new home, New York City. Regina tries to live up to her nickname by baking disgusting cupcakes. To raise money, her class sells them at a wizard convention, causing attendees to lose control of their stomachs and their magic. Why I picked it up: It’s a sequel to The Really Rotten Princess. Why I finished it: Regina’s cupcakes include lizard scabs, eau de gas, toe jam, essence of ear wax, frog dandruff, and another ingredient that’s even more gross. It's perfect for: Little kids who love Dirty Bertie’s utterly gross antics and who think plastic vomit is funnier than fake dog poo. @bookblrb: Regina bakes disgusting cupcakes for a wizard convention. Dr. Eggman and Dr. Wily have crafted a twisted pocket dimension-the Skull Egg Zone! Sonic, Mega Man, Tails, Proto Man and Rush have found their way into the zone, but how will they find the Doctors in this nightmare world? To make matters worse, Sonic's friends have been turned into the eight menacing Roboticized Masters! Can Sonic and Mega Man overcome these fearsome robot warriors? Can Sonic's friends be saved? And what new weapons can Mega Man gain from this fusion of Eggman and Wily technology? A solitary duck lives a contented and orderly life, until a new neighbor duck (Chad) moves into the house next door and turns everything upside-down. Why I picked it up: I'm a big fan of Castellucci’s novels for teens and Varon’s graphic novels. Why I finished it: I loved the way that Theodora considers herself to be perfectly normal, despite many unusual habits, including the fact she swims laps while balancing a cup of tea on her head. When she starts to get to know Chad, she considers him strange because he dyes his feathers bright colors and constructs elaborate, conceptual art in his yard. It's perfect for: My four-year-old buddy, Thekla, who is already showing great signs of self-confidence and personality and loves to wear swirling, purple and pink dresses. Like me, she’ll be bummed when they have a falling out over a snide remark made by a third party, but happy again when Theodora realizes Chad would never lie and takes measures to fix their relationship. @bookblrb: A solitary duck’s orderly life is disrupted by her new neighbor. What if the dumbest idea ever turned your life upside down? The further adventures of Ang the Avatar and his friends, in vignettes that take place between various episodes of the original Avatar: The Last Airbender animated series. Why I picked it up: At ALA last year I was telling Dave Roman how I had gushed sloppily to Gene Luen Yang about his Avatar graphic novels, which take place between the original series and The Legend of Korra. Dave revealed that he had edited the stories in this book, some of which were originally published in Nickelodeon Magazine. He sold me a signed copy, and just like that my parental gift shopping was complete. Why I finished it: The stories and the art are incredibly varied. Some, like “Sokka the Avatar,” featuring Sokka's girl-chasing ego in action, are pitch-perfect, and so much like short TV episodes that you could be forgiven for mistaking them for a photonovel. 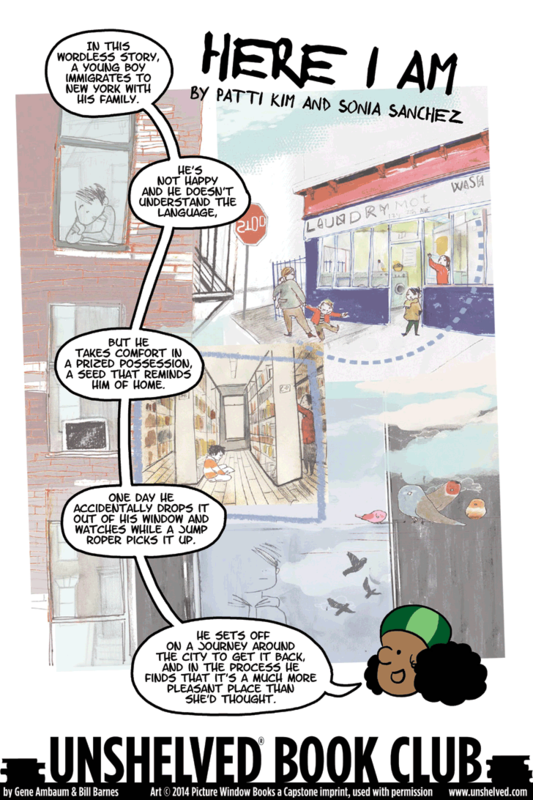 But others are very different, like “Fruit Stand Freestyle,” a two-page, wordless, action-rich, black-and-yellow (!!) story about Momo, and “Gym Time,” which is like an episode of a cartoon that might be called Avatar Babies. It's perfect for: Jana, who started watching Avatar as research for a dance performance featuring woman warriors bending the elements, then got hooked and watched until the end. She will love Combustion Man on a Train, which features Toph teaching breathing exercises to helpless civilians as a battle rages on around them. @bookblrb: Short comics featuring Ang the Avatar and his friends. Featuring Ursula Vernon's trademark comic book hybrid style, the Dragonbreath graphic novel series is guaranteed to make you laugh until smoke comes out your nose! Thanks to a fearless attitude, a faithful best friend, a little creative thinking, and a knack for attracting trouble, Danny always finds a way to battle the beasts and come out on top. By integrating illustrations with text, Ursula Vernon’s Dragonbreath books are perfect for read alouds, small groups, or independent reading. Have fun with the Dragonbreath curriculum guide! Garth is reading a comic book on his bed when a skeletal ghost horse plunges through his wall and captures Garth in its rib cage. The horse is running from Frank, a worn-out ghost hunting agent who sends it back to the afterlife without noticing that Garth is inside. A very apologetic Frank then explains to Garth's mother that both the the horse and Garth are now where all dead things go. Frank feels compelled to rescue Garth, so he turns to his sarcastic, bitter, dead ex-girlfriend Claire for help. (She works as a mechanic and might just have a machine to get them both to the afterlife.) Meanwhile, Garth and the fleshless horse, which he has christened “Skinny,” are hunted by raptor skeletons before making it to Ghostopolis. As a live person in the city of the dead, Garth stands out like a beacon, drawing the attention of the city's controlling dictator, Dean Vaugner, who wants Garth's living energy. His dead grandfather helps Garth stay a step ahead of Vaugner, hopefully until Frank and Claire can arrive. Because if Garth dies in Ghostopolis, he will stay there forever. Why I picked it up: A recommendation from one of my middle-school students who said it was so awesome I had to read it. I did immediately, during lunch in the faculty room, earning some strange looks from the teachers. Why I finished it: Garth’s relationship with his grandfather’s ghost. It progresses from being a child when first meeting Garth to an older man by the end of Garth’s stay in Ghostopolis. Garth's mother had been estranged from her father, so this is a chance for Garth to get to know him for the first time. I teared up while finishing the book because of an unexpected repair in Garth's family relations. Luckily, by that point I was in my office and I could wipe my eyes without anyone noticing. Readalikes: Believe it or not, this is a great readalike for Smile and Drama, both by Raina Telgemeier. Each of them is intended for a middle school audience yet has jokes and references that appeal to much older readers. Any of these three books would be a fantastic way for a parent and child to read together because both would get something out of it. @bookblrb: After accidentally sending a young boy to the afterlife, Frank asks his dead ex-girlfriend for help. An old storyteller sits by the fire and tells his faithful dog eight different folktales. The dog tells him one as well. Why I picked it up: I liked the looks of this one, especially since it was based on a TV show by Jim Henson’s studio. Why I finished it: Each story is adapted by a different comics artist and writer, so there is a different style every few pages. "Old Nick and the Peddler" by Roger Langridge and Jordie Bellaire starts the volume with a brightly colored story about the Devil getting his due. "The Milkmaid and Her Pail" by Colleen Coover looks like an old-fashioned oil painting of the Aesop fable. "Old Fire Dragaman" by Jeff Parker and Tom Fowler tells an Appalachian Jack story in bright acrylics. "The Frog Who Became an Emperor" by Paul Tobin and Evan Shaner uses a clean comic style that gives the Chinese fable a surreal quality. “Puss in Boots” by Marjorie Liu and Jennifer L. Meyer has a pale, ethereal quality that reflects its French origin, while “The Crane Wife” by Katie Cook is done in a watercolor manga style that shows it’s Japanese. @bookblrb: An old storyteller and his dog share folktales by a fire. Why I picked it up: A billowing maelstrom of dust clouds blasts the title across the cover, bending power lines and tilting a jalopy as if might tumble off the book. Why I finished it: “Oh my God! Here it comes!” are the farmer's first words as humans and animals flee the blast. The book explains that huge swaths of fertile grasslands were plowed and planted with dry-land wheat because of a steep rise in wheat prices, speculation, and newly widespread availability of tractors. When the Great Depression struck, the market collapsed. Doubling the farmer's difficulties, the once frequent rains all but stopped; a ten-year drought withered crops and generated huge dust storms that swept the region. Dust drifted like snow, piling up against fences and buildings. It also buried and suffocated outdoor livestock, and blew through holes in farmhouse walls, into the homes and lungs of everyone who hadn't fled. Readalikes: Frank Young and David Lasky’s Oregon Trail: The Road To Destiny is another fine bit of American History presented in comics, as are Don Brown’s other notable non-fiction graphic novels including Gold! Gold! From the American River! (about the California Gold Rush) and America is Under Attack (about 9/11). @bookblrb: A family tries to survive the Black Sunday Monster Dust Storm on April 14, 1935. Kids Can Press, 2012. 9781554537686. Kids Can Press, 2013. 9781554539635. Binky’s new rank means that he doesn’t just have to protect humans from aliens, he also needs to help train the next generation of space cats. Then Gordon shows up. He’s not a kitten. He’s not even a cat. He’s a dog. The humans are going into deep space. Binky, Gordon, and Gracie (another cat) are dropped off at the pet hotel. They do their best to escape, but as they’re making a break for it, they discover that the space cats organization has been betrayed by one of their own. Why I picked them up: Ashley Spires is one of my favorite comics artists. I always read her books. They’re perfect for: Shannon. Every time we find a new book for kids about toilets or poop, we send each other an email. She’ll love that when the “aliens” (bugs) are too interested in Gordon’s business, Binky draws the only logical conclusion -- Gordon is a double agent using his poo to send messages to them. And she’ll laugh at the look on Binky’s face when he remembers getting his temperature taken at the vet’s. @bookblrb: Binky trains the next generation of space cats and does his best to escape a pet hotel. The Little Prince leaves his comfortable asteroid and the beautiful Rose, traveling the universe in the company of the wisecracking Fox as they search for the Snake that controls people through their fears. In Book Six, the Little Prince arrives on a planet where the people fear the night globes, beings which look like flying eyeballs. They are convinced they must have light all night long to keep the night globes away; a salesman (controlled by the Snake) sells lights to everyone. But the night globes are much more innocent than they appear. Why I picked them up: The Little Prince is a modern classic. I had to read this graphic novel series to see if the adaptation would do it justice. They’re perfect for: Sophie, who likes gentle stories with just a hint of menace and happy endings for everyone. She would enjoy how the Little Prince uses his magic sketchbook to create the tools he needs in dire situations, like when he draws a strange-looking instrument that blows away the Gloomies (who work for the Snake). @bookblrb: The Little Prince finds missing stars and travels to a planet where a salesman profits from peoples’ fears.